There is generally legislation requiring that the odds in gaming devices be statistically random, to prevent manufacturers from making some high-payoff results impossible. Since these high-payoffs have very low probability, a house bias can quite easily be missed unless the odds are checked carefully. Because contracts of insurance have many features in common with wagers, insurance contracts are often distinguished under law as agreements in which either party has an interest in the "bet-upon" outcome beyond the specific financial terms. e.g. : a "bet" with an insurer on whether one's house will burn down is not gambling, but rather insurance – as the homeowner has an obvious interest in the continued existence of his/her home independent of the purely financial aspects of the "bet" (i.e., the insurance policy). Nonetheless, both insurance and gambling contracts are typically considered aleatory contracts under most legal systems, though they are subject to different types of regulation. Ancient Hindu poems like the Gambler's Lament and the Mahabharata testify to the popularity of gambling among ancient Indians. However, the text Arthashastra (c. 4th century BC) recommends taxation and control of gambling. Ancient Jewish authorities frowned on gambling, even disqualifying professional gamblers from testifying in court. 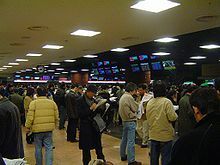 The Catholic Church holds the position that there is no moral impediment to gambling, so long as it is fair, all bettors have a reasonable chance of winning, that there is no fraud involved, and the parties involved do not have actual knowledge of the outcome of the bet (unless they have disclosed this knowledge). Gambling has often been seen as having social consequences, as satirized by Balzac. For these social and religious reasons, most legal jurisdictions limit gambling, as advocated by Pascal. as long as the following conditions are met; the gambler can afford losing the bet, stops when the limit is reached, and the motivation is entertainment and not personal gain leading to the "love of money" or making a living. In general, Catholic bishops have opposed casino gambling on the grounds it too often tempts people into problem gambling or addiction, has particularly negative effects on poor people; they sometimes also cite secondary effects such as increases in loan sharking, prostitution, corruption, and general public immorality. Some parish pastors have also opposed casinos for the additional reason that they would take customers away from church bingo and annual festivals where games such as blackjack, roulette, craps, and poker are used for fundraising. Although different interpretations of Shari‘ah (Islamic Law) exist in the Muslim world, there is a consensus among the ‘Ulema’ (Arabic: عُـلـمـاء‎, Scholars (of Islam)) that gambling is haraam (Arabic: حَـرام‎, sinful or forbidden). In assertions made during its prohibition, Muslim jurists describe gambling as being both un-Qur’anic, and as being generally harmful to the Muslim Ummah (Arabic: أُمَّـة‎, Community). 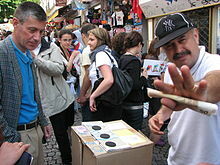 The Arabic terminology for gambling is Maisir. In parts of the world that implement full Shari‘ah, such as Aceh, punishments for Muslim gamblers can range up to 12 lashes or a one-year prison term and a fine for those who provide a venue for such practises. Some Islamic nations prohibit gambling; most other countries regulate it. Gloria Mundi, or The Devil addressing the sun, a cartoon showing the British politician Charles James Fox standing on a roulette wheel perched atop a globe showing England and continental Europe. The implication is that his penniless state, indicated by turned-out pockets, is due to gambling. Studies show that though many people participate in gambling as a form of recreation or even as a means to gain an income, gambling, like any behavior that involves variation in brain chemistry, can become a harmful, behavioral addiction. Behavioral addiction can occur with all the negative consequences in a person's life minus the physical issues faced by people who compulsively engage in drug and alcohol abuse. Reinforcement schedules may also make gamblers persist in gambling even after repeated losses. [medical citation needed] This is where the mafia often ends up making large profits, for example the Lucchese crime family book maker and collector "Big Mike Edwards" aka "Mikey muscles" would allow gamblers lines of credit and charge high percentage rates known as vigs to be paid weekly. Late or missed payments would result in visits and threats from such crime family members. Preference for likely outcomes. When gambles are selected through a choice process – when people indicate which gamble they prefer from a set of gambles (e.g., win/lose, over/under) – people tend to prefer to bet on the outcome that is more likely to occur. Bettors tend to prefer to bet on favorites in athletic competitions, and sometimes will accept even bets on favorites when offered more favorable bets on the less likely outcome (e.g., an underdog team). Reluctance to bet against (hedge) desired outcomes. People are reluctant to bet against desired outcomes that are relevant to their identity. Gamblers exhibit reluctance to bet against the success of their preferred U.S. presidential candidates and Major League Baseball, National Football League, National Collegiate Athletic Association (NCAA) basketball, and NCAA hockey teams. More than 45% of NCAA fans in Studies 5 and 6, for instance, turned down a "free" real $5 bet against their team. From a psychological perspective, such a "hedge" creates an interdependence dilemma – a motivational conflict between a short-term monetary gain and the long-term benefits accrued from feelings of identification with and loyalty to a position, person, or group whom the bettor desires to succeed. In economic terms, this conflicted decision can be modeled as a trade-off between the outcome utility gained by hedging (e.g., money) and the diagnostic costs it incurs (e.g., disloyalty). People make inferences about their beliefs and identity from their behavior. If a person is uncertain about an aspect of his or her identity, such as the extent to which he or she values a candidate or team, hedging may signal to him or her that he or she is not as committed to that candidate or team as he or she originally believed. If the diagnostic cost of this self-signal and the resulting identity change are substantial, it may outweigh the outcome utility of hedging, and he or she may reject even very generous hedges. ^ Rose, I. Nelson; Loeb, Robert A. (1998). Blackjack and the Law (1st ed.). Oakland, CA: RGE Pub. p. 109. ISBN 978-0-910575-08-9. ^ "Definition as Gaming". United Kingdom Office of Public Sector Information. Retrieved 22 September 2012. ^ Humphrey, Chuck. "Gambling Law US". Gambling-Law-US.com. Retrieved 22 September 2012. ^ "UK Gambling Commission". Gamblingcommission.gov.uk. Retrieved 22 September 2012. ^ Schwartz, David (2013). Roll The Bones: The History of Gambling. Winchester Books. ISBN 978-0-615-84778-8. ^ Murdoch, James (1926). A History of Japan. 3 (reprint ed.). London: Psychology Press (published 1903). p. 325–326. ISBN 978-0-415-15417-8. Retrieved 6 April 2018. 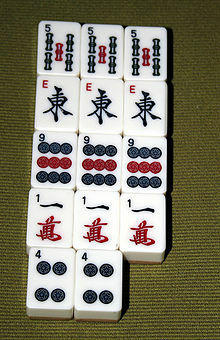 Many Japanese are naturally prone to gambling; in the old Kyoto court the vice was rife, and in the fourteenth and fifteenth centuries samurai would often stake their arms, armour, and horse trappings on a cast of the dice, even on the eve of a battle, and so have to go into action in incomplete panoplies, and sometimes with no armour at all. In Tokugawa times the vice did not reach this extent among the samurai, but it became common in Yedo and continued to be so throughout the history of the city. ^ Wilkins, Sally (2002). Sports and Games of Medieval Cultures. Greenwood. ISBN 978-0-313-36079-4. ^ Thomassen, Bjørn (2014). Liminality and the Modern: Living Through the In-Between. Ashgate Publishing, Ltd. p. 160. ISBN 978-1-4094-6080-0. Retrieved 17 August 2015. ^ "Nevada Gaming Control Board : Home". Retrieved 5 September 2016. ^ Kucharek, Rev. Cass (1974). To settle your conscience a layman's guide to Catholic moral theology. Our Sunday Visitor. ISBN 978-0-87973-877-8. ^ D. Adamson. "Blaise Pascal – Mathematician, Physicist and Thinker". Palgrave Macmillan. Retrieved 5 September 2016. ^ "Is Gambling a Sin?". 2 January 2013. Retrieved 5 September 2016. ^ Mike Latona. "State's bishops oppose casino expansion". Catholic Courier. Archived from the original on 11 June 2016. ^ "Catholic bishops oppose casino idea". Retrieved 5 September 2016. ^ "Book of Resolutions: Gambling". ^ "The Free Methodist Church (UK) | Why we don't encourage gambling". ^ "The Church of the Nazarene, Doctrinal and Ethical Positions". ^ "Quaker View of Gambling". ^ "Gambling". 26 June 2012. ^ "Southern Baptist Convention > Resolution on Gambling". ^ "Gambling". LDS.org. Intellectual Reserve, Inc. Retrieved 14 May 2018. ^ "The Unofficial Site of the Iglesia ni Cristo". ^ "The Game of Two up". Gambling Info. Retrieved 22 September 2012. ^ "US election betting backs Bush". ABC.net. 28 October 2004. Retrieved 22 September 2012. ^ "Symptoms and causes". Mayo Clinic. ^ a b c Morewedge, Carey K.; Tang, Simone; Larrick, Richard P. (12 October 2016). "Betting Your Favorite to Win: Costly Reluctance to Hedge Desired Outcomes". Management Science. 64 (3): 997–1014. doi:10.1287/mnsc.2016.2656. ISSN 0025-1909. ^ Simmons, Joseph P.; Nelson, Leif D. (2006). "Intuitive confidence: Choosing between intuitive and nonintuitive alternatives". Journal of Experimental Psychology: General. 135 (3): 409–428. CiteSeerX 10.1.1.138.4507. doi:10.1037/0096-3445.135.3.409. PMID 16846272. ^ Simmons, Joseph P.; Massey, Cade (2012). "Is optimism real?". Journal of Experimental Psychology: General. 141 (4): 630–634. doi:10.1037/a0027405. PMID 22329753. Look up gambling in Wiktionary, the free dictionary. 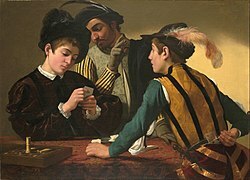 Wikimedia Commons has media related to Gambling. This page was last edited on 9 April 2019, at 12:54 (UTC).